Atlanta City Council members Andrea L. Boone (District 10) and Michael Julian Bone (Post 1 At-Large) hosted More MARTA’s fourth, and final, community forum at the C.T. Martin Recreation Center. Nearly all chairs were occupied, estimating around 50 seats. MARTA will spend $2.5 billion over the next 40 years and the council, along with their represented districts, have iterated concerns at the forums and by survey. According to earlier project proposition surveys, commuters’ opinions fail to sway. During the forum, commuters urged immediate attention to basic detail. “Can I get a clean bus?” a More MARTA forum attendee asked. “[Commuters] consistently focus on more fixed transit like longer hours of operation, increased reliability, safety and cleanliness,” Bingaman said. Bus rail transit (BRT) improvements have immediately gone into effect. MARTA can expedite bus rail transit expansion, but focusing primarily on BRT could provide setbacks with new rail investment. Some attendees shared Keahey’s sentiment. Southeast and northwest areas lack transit based on the current proposal. “Southeast side folks want their needs met better [in addition to the] northwest side,” Bingaman said. Lacking expansion in the southeast and northwest while providing transit to neighborhoods outside Atlanta confounded some attendees. “We agreed to pay [the] sales tax. Two years ago, Emory [and the northside] was not a part of Atlanta. 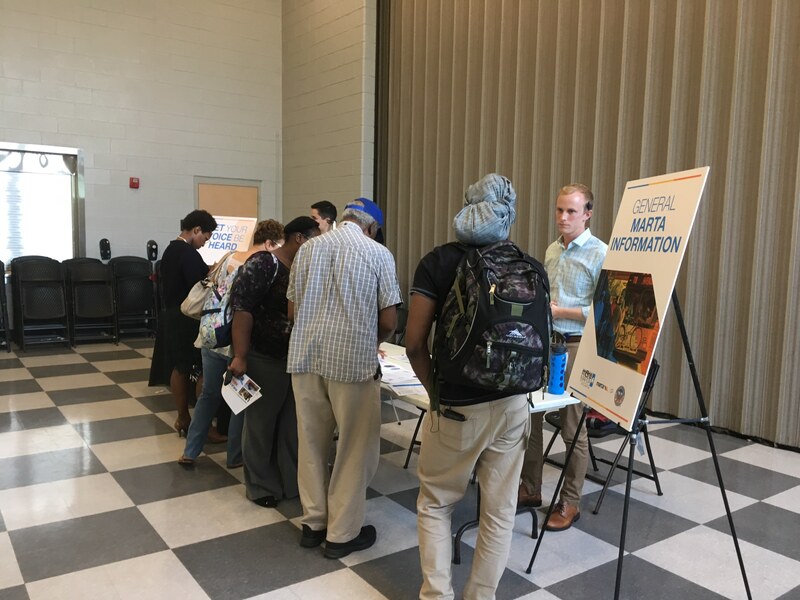 Does MARTA really think the people of Atlanta voted to pay transit to a section of a town that was not a part of Atlanta?” a More MARTA forum attendee asked. Yet, 70 percent approval begs the question: approval from whom? Large-scale, urban development projects typically result in higher land and housing costs, making it difficult for low-income citizens to sustain their living situation. Gentrification has increased displacement of low-income residents, increasing their poverty in Old Fourth Ward and on Auburn Avenue, a historical African-American neighborhood. And the growth will outsize MARTA within five year. The Atlanta-region Transit Link Authority (ATLtransit), the organization overseeing MARTA, the Atlanta streetcar, Gwinnett Xpress and all other metro Atlanta transit platforms will fold into The ATL by March of 2023. The Atlanta Regional Commission’s (ARC) goal has been to increase mobility across county lines and other jurisdictions. With The ATL lurking behind MARTA, some commuters questioned why they should focus on MARTA at all. On March 29, the Georgia General Assembly passed legislation that creates the funding framework for The ATL, a regional transit governing system for metro Atlanta’s entirety. The ATL will plan transit across 13 metro counties, utilizing existing transit such as CobbLinc, Gwinnett County Transit, GRTA’s Xpress service and MARTA. “We are privileged to learn what The ATL is going to be. It’s going to have an impact on how we do business at MARTA, as well as how we look at transit throughout the entire region,” Keahey said. Though, the ARC’s lack of community outreach creates skepticism among some commuters. “We need the ARC to be visible, transparent, accountable and doing what [MARTA] is doing, being articulate. And not having MARTA do the hard work while the [ARC] has all their meetings in the shadows,” Williams said. The ARC will oversee metro Atlanta’s long-term transportation plan. “We’re chasing MARTA, but not chasing The ATL while they make huge decisions. We think it’s all in MARTA’s hands and it’s not,” Williams said. The 16-member board for The ATL will be named by Dec. 1 and will serve a four-year term.